Wonderful Villa with great indoor/outdoor space for gathering with friends and family. Enjoyed grilling steaks, having a glass of wine by the fire pit and spending time in the pool/spa to wind down from a great day of golf on one of the best courses in the world. Ricardo from Lifestyle was fantastic, helping us with dinner out in town, arranging cars and helping us restock the house. Would highly recommend Casa Tortuga and look forward to returning soon. Our stay at Casa Corona (thru Lifestyle Villas) was fantastic! From setting up the reservation with Diana, to all our pre-trip communications with Rosa, to our in Cabo host, Ricardo, this was easy and professionally handled. The house itself is great! Big, roomy, comfortable, etc. Home is well taken care of. 4 bedrooms in main house + 1 casita. Sits on top of hill and is oriented to catch sun up over the Sea of Cortez in the morning and sundown over the hills to the west in the evening. We certainly look forward to staying here again. Mucho graias! Unbelievable home with amazing views! We loved the very private beach. Lifestyle Villas did a fantastic job with all the details for our trip....from airpot transfers, to our concierge Daniel, and our housekeeper Sonja....nothing was overlooked! 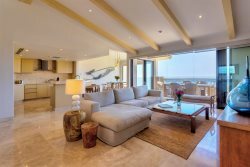 My wife and I went on the hunt for a villa in Cabo that fit what we were looking for. We had 50 guests attending our wedding and Villa Serena was able to supply us with all the necessary requirement to make it our primary choice. We stayed here for a short time the first week in November.Beach Front,Private Beach,Open Floor plan, Clean, Modern, Full AmenitiesAn area to have the wedding on the beach and large enough deck to hold our reception.We had a great overall stay for the short time we spent here. Hector was a wonderful concierge who took care of all our needs and requests during our stay. Location was a bit difficult from the time we originally chose the villa in January until November due to the ongoing construction in the area. Even with the ongoing construction, our stay was not handicapped by it in any way.Cleaning Staff was friendly. Had a personal check come in on our last day and make us an american breakfast which was a delight.Property Condition was exceptional from exterior to interior furniture and linens.Location was between Cabo San Lucas and San Jose Del Cabo. Difficult to find since signage for the private area is not easy to see from the main street so easy to miss which many taxi drivers did. Community and area was very quiet and safe.Myself and our guests all agreed that we would stay here again in the future. Tammi and I have stayed in OMB 11C many times. The first thing we say when we cross the threshold is, "Good to be back home!" The Lifestyle Villas staff is the most professional in the industry. I would like to say they get right on things that need to be fixed, but nothing is ever non operational! The place is always perfect! OMB is by far the best location in Cabo. This is why we always ask for it. Go out the door and a few feet to the right and you are on the beach. Go out the door and a few feet to the left and you are on the harbor and at the night life. Sitting on the balcony at dusk is amazing as well! Can't think of a better place to spend a vacation! We loved watching the sun rise from the hot tub many mornings, then, cooling off in the pool later while looking out to the ocean. On the beach watched crabs pop into their holes or scuttle away from us which was fabulously funny. The house was gorgeous,very comfortable,includes wonderful art, and my husband loved cooking on the Wolf stove and using the well laid out kitchen.The staff and care of the home is above and beyond what we expected. We didn't want to leave. Our rental of Casa Bella was ideal. The service leading up to and during our stay was exceptionally responsive and helpful. The home was clean and well appointed with everything we required. It was safe and located ideally between San Jose and Cabo San Lucas. Great experience! Loved the location, spacious accommodations, everything was great. Close to everything, beach, harbor, bars, restaurants. We loved our villa and couldn't wait to get back to it every time we left. The house, the beds, the pool, the appliances, the towels, the view....all perfect. I just got back from celebrating my 40th birthday and we stayed at Casa Corona. We had 4 couples and the house was PERFECT for our group. Ricardo was so friendly and amazing with all of our requests. As far as Chef Manuel and his crew.....AMAZING!!!!! His food was so good and they were all so nice. I miss them all already. We had such a great time at this house that we are already talking about when we can go back. Went to a golf trip with 8 friends. All in the house was as expected or exceeded our expectations; service, cleanness, amenities, location etc. everything was superb. Prof of this, all my friends are now asking to maintain this tournament as a tradition arriving at this same property. We have stayed twice now at this villa/home. It is nicely appointed with a nice dcor. The 4 masters are all nice size rooms and accommodated two couples and x2 kids easily. The Concierge/Butler Ricardo did an excellent job helping us with any questions and with coordinating activities, etc... The view and pool is simply amazing!!! Highly recommend this home to anyone! Casa Corona is a beautiful house! The details were very high end and the rooms were very large and the bathrooms even more so. The location is great, very close to Costco and Walmart for your every need. Just a short ride to town as well. Ricardo, our concierge was very attentive and helpful. He made dinner reservations, zip lining arrangements and of course airport arrangements. We very much enjoyed having a breakfast and a dinner prepared by the chef staff. Very organized, clean, and delicious! This was a perfect house for the group we had. The 5 large bedrooms provided everyone with luxurious privacy and the large dining table and couches gave us time together with room to spare. The pool area has everything you could want, including a beautiful view of the sun coming up and sunset over the beautiful pool. I would also like to give a shout out to the golf course as well. Even though it was steps away from a tee box, it was very private. You could not see the golfers and they could not see you. Well done! I would rent again in a heartbeat. Incredible stay at Casa Maravillas! What a gorgeous house & a great location. Perfect for relaxation with great access to the pool at Punta Ballena and the pool at the Auberge Residences. We rented this house for a family vacation of 13 of us. 8 Adults, 2 children and 3 babies. We had the best time. Everyone enjoyed them self and it was a beautiful home. Would rent this home again! The staff is very helpful and wonderful to work with. We had a great time!!!!!! all of us were very pleased with the home and beautiful terrace. The house is very well equipped and maintained for a property that has been leased. It is for sure managed by an exceptional company that will take care of all your needs with anything within reason. I for sure request this property again. We had 4 couples and one single in our group. This was a perfect villa for our party. I highly recommend the chef. We had every breakfast prepared and one dinner. It was amazing. The villa is s short drive to Cabo and the Sheraton is an easy walk. Would stay again without hesitation. Overall, we had a wonderful time at Casa Bella. The main villa is very nicely appointed, and the private sandy beach just a few minutes walk away was amazing! Lots of great common space to eat and play games, overall - a really great long weekend. The pool deck area had great views and overall it was really a perfect setup for group trip, we LOVED it! Additionally, the pre-trip planning was incredibly thorough and Rosa was very helpful. A few misses: 1) The ice machine was broken- we were told it was just "turning on" but it never produced ice, so we had to get more delivered from the store 2) While Hector was very nice, he wasn't very available during our stay. We asked for an additional set of groceries once we got to the villa, and ended up never getting the extra groceries. We asked him to arrange a taxi for us and it arrived 15 minutes late and overcharged us. 3) The initial grocery stock was nice, however we were stocked with some pretty bad wine that we didn't ask for and didn't drink for but unfortunately had to pay for 4) The 5th bedroom is separated from the rest of the house, and is essentially an offshoot of the garage. It doesn't have much natural light, just something to note. What a great company ....From top to bottom all expectations were met and exceeded! Lifestyle Villas is a great company....Our home was great with great location and access to the Sheraton Hacienda pool and beach was great. This home was an awesome place and the service top notch. GREAT VIEW, AWESOME ATENTION, THE POOL AND HO TUB WERE THE BEST OF ALL. Everything about this property is amazing. It is beautiful, in great condition, very luxurious. The concierge service was very helpful. They stocked the house for us, cleaned regularly, and helped us with all arrangements. The kids did not ever want to leave the pool and the hang out space is amazing. Our least favorite thing was the meal we had cooked at the house - but it was still pretty good and super convenient. I cannot imagine a better place to stay!!!! We stayed at Casa Juan Miguel. It was amazing. The golf was incredible, played both the Ocean and Desert courses. Could walk to the club house from our house. Easier to drive, but one day we needed to "divide and conquer" and some walked to the club house, some walked to the spa at the Sheraton and some took the car to go fishing.The staff at Lifestyles are incredible-both the preplanning staff and the concierge staff that came by each day to make sure we were doing okay. The chef services were our favorite dining events. The food was delicious and staying in, enjoying the view and all the amenities of the house, was the perfect combination. Having groceries at the house when we arrived was wonderful. We did rent a car, and were glad we did. We stayed in on the days we didn't have a planned event and those were very fun days- the pool area is beautiful. I think my favorite part of our stay was opening the sliding doors all the way open and enjoying the fresh air all day, only closing them at night when we went to bed. Coming from 18 degrees in Denver, this was a real treat.I recommend this house whole-heartedly. And, Lifestyles entire crew- it was the perfect vacation.